On 6 October 1984, Don Mullan and Margaret Beatty were married. As well as families and friends, all of Mullan’s AFrI colleagues and Executive Committee attended, as did the AFrI special adviser, Sean MacBride SC. Many AFrI supporters also attended, including the Derry boys who had inspired the St. Brigid’s Peace Cross Campaign. AFrI’s patron, Fr Robert Nash SJ, officiated, assisted by, amongst others, Fr. Niall O’Brien. Mullan’s AFrI colleague, Joe Murray, was groomsman. 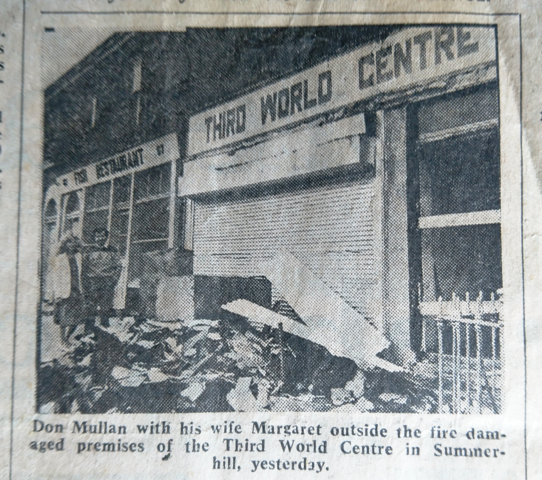 On the evening of their wedding AFrI’s headquarter’s, The Third World Centre, Summerhill, Dublin, was attacked and set on fire. It was the third attack in as many months, but on this occasion it was to end AFrI’s very positive engagement with the local Summerhill and Sean MacDermott Street community. The newly weds spent the afternoon of their first day of marriage sifting through the rubble of AFrI before leaving on their honeymoon around Ireland. AFrI moved temporarily to nearby Buckingham Street where they were welcomed by the Prisoners Rights Organisation (PRO). 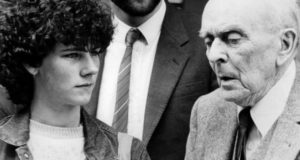 Following discussions with Mullan and his colleagues, the PRO made discreet enquiries locally to determine whether the attack had been carried out locally or by outsiders. Originally, when AFrI suffered its first attack, its premises had been ransacked in a manner that could have been the work of petty thieves from the locality looking to see if money was kept on the premises. They got nothing. The second attack and finally third attack in which its premises were set on fire, showed a degree of intent and intimidation that seemed beyond the motivation of petty thieves. Furthermore, Mullan and his colleagues had developed a very good relationship with the local community, the highlights of which were the 1982 international conference on world peace and poverty; the stop-off by Fr Niall O’Brien upon his return to Ireland following his imprisonment in the Philippines; and the visit by Bishop Desmond Tutu in the summer of 1984. AFrI suspicions that the attack may have been my outsiders was heightened by the opinion of the organization’s Special Adviser, Sean MacBride SC. All three attacks happened in the aftermath of the visit to Ireland by Bishop Desmond Tutu, hosted by AFrI, during which he again called for economic sanctions against the apartheid regime. And, more recently, Mullan had persuaded Tutu to publicly declare his support for the Dunne’s Stores Strikers. 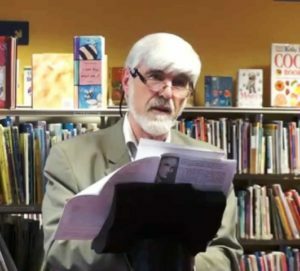 MacBride was of the opinion that the attacks may have been politically motivated by agents of the apartheid state whom, he said, were active throughout the world; and who were tasked with disrupting the work of groups and organizations who were running effective campaigns against the regime. Following their investigations, the Prisoners Rights Organisation informed AFrI that their contacts in the locality had reported back to them that locals had not been involved in the attack. Those responsible were never identified. 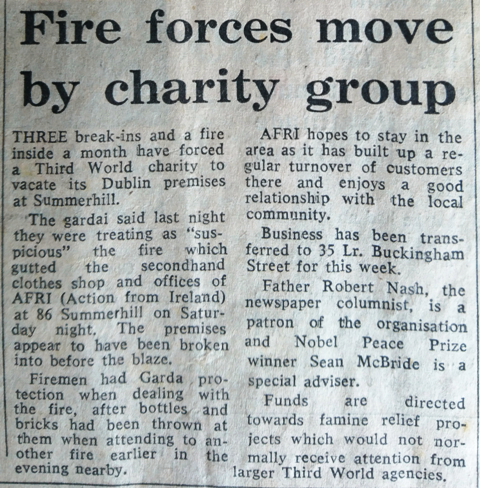 Within a couple of months of the destruction of their premises, AFrI moved to premises on Mountjoy Square, Dublin. A major part of AFrI’s spirit – its relationship with the Sean MacDermott Street community – was lost. The move, however, was to have a silver lining for Mullan. A floor above the new AFrI offices in Mountjoy Square housed the premises of Wolfhound Press, one of Ireland’s leading publishers, founded by Irish poet Seamus Cashman. Occasionally Mullan and Cashman met on the stairwell leading to their respective offices. The two men became friends, a friendship which remains strong to this day. In 1996, when Mullan was working on Bloody Sunday, it was to Seamus Cashman and the Wolfhound Press he turned. Their partnership was to play a significant role in changing the course of history.